The winding roads with hairpin curves offered breathtaking views of peaks, some rocky with sheer cliffs, and devoid of any vegetation. Dizzying ravines reminded me of what could happen if my driving faltered. Rivers were discharging angry waters at the bottom of straight drops. The unusually hot and sunny fall weather cast dark green shadows on the picturesque landscape. Waterfalls distant and near thundered and broke the silence, echoing against the rocky cliffs. It was as close to heaven as anyone alive could be. I parked at the bottom of the ravine and started walking up the steep cobbled road, flanked by old spruce trees. Suddenly, a giant rock revealed one of the castle towers. Built of river rock, stone, brick, and wood, the castle had an irregular shape to fit its narrow location on a crag. The view from the eagle’s nest could easily scan miles of terrain on a clear day. The inspirational castle of Bram Stoker’s “Dracula,” was strategically located on a rocky bluff, difficult to conquer, tiny by any definition of a castle, and surrounded by stone turrets. The savage nature of the landscape surrounded it with mystique. To Westerners, Vlad Tepes was Vlad the Impaler, a ruthless ruler demonized in many German writings of the 15th century. To Bram Stoker’s novel fans, he was the inspiration for Count Dracula. Bran Castle was built more than 600 years ago. In 1377, King Louis gave the citizens of Brasov the right to build a fort at Bran at their expense. A citadel was erected by 1382. In early 1400s, the fortress was entrusted to Mircea cel Batrin to help the Wallachian ruler to continue his anti-Ottoman policy. The one and only reference to Vlad Tepes was in 1459 when his troops passed through Bran, attacked and looted Brasov, following the disputes between the Wallachian ruler and the Brasov traders. Perhaps for commercial reasons, the legend of Bran Castle as Vlad’s property stuck. The castle changed hands several times until 1920 when the town of Brasov donated it to the new sovereigns. Queen Maria of Romania turned the fortress from a ruin into a habitable castle and a royal court with water and electricity. The Czech architect Karel Liman drew the plans. Three neighboring villages were also connected to the electric plant and the Queen had three telephones installed and an elevator. The steep cobbled walk up to the castle is flanked by huge pine trees. 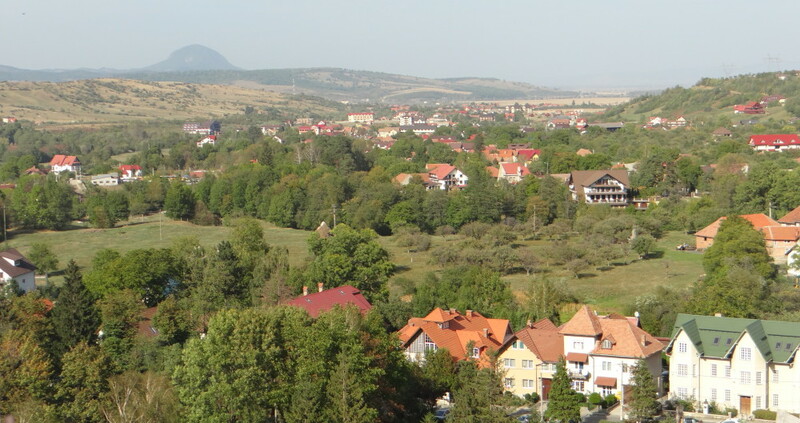 On the left are model farm homes typical of Transylvania and on the right is a thatched roof house with a thick coat of moss. A small lake in front of the lodge reflects the shadows of the deciduous trees surrounding it. A large stone cross with Cyrillic writing leads up to the bottom of the crenelated rock that that castle rests on. The castle sits so high, it is a perfect place to defend against any Ottoman invasion. The entrance has 29 steep steps carved into stone. Throughout the castle, there is a mixture of carved stone steps and wooden stairs, always an odd number. The first room has a huge fireplace with a cooking stove. In fact, every room has a fireplace or a highly ornate porcelain stove. Queen Maria’s bedroom has a highly ornate throne. The furniture is solid, with exquisite carvings and beautiful hand-woven colorful rugs, adorned with the Queen’s favorite color, red. She is pictured in many photographs on the walls in her favorite native costume, a white blouse called a “ie,” hand-embroidered, and a red skirt. Wooden trunks contained the Queen’s dowry. The ascetic simplicity of every room bears witness to the Queen’s uncomplicated life. The inner courtyard is tiny but has room for a well. The rocky, natural beauty is adorned by red geraniums and dark wood railings. The warm ochre painted turrets and a balcony wrap irregularly around the courtyard. There is a secret stone passage to the upper floors into the main turret with a 360-degree view. The 33 stairs are winding and narrow, difficult to climb, to fit through, and rather cold. A drafty chill blew and brushed my left side as if a hand was trying to touch my shoulder. I looked over my left several times; I felt an eerie unease. How many have escalated this secret passage and for what purpose? A large room opens up with a huge bear rug staring at me in front of a fireplace. A Roman style reclining couch and a piano complete the décor. Tiny, medieval sized windows allow minimal light. A creepy music is lingering from the secret staircase. The room actually opens onto a porch that overlooks the stone courtyard. The castle turrets and the mountains behind it give the room more appeal in spite of the tiny windows. On a clear day, the turret guards could see the enemy coming for miles and miles. The top tier of the castle gives a spectacular 360 degree view of the mountainous area. From the belvedere, the sentinels were keeping constant watch. The numerous wooden creaky stairs and the solid, narrow passage carved into the rock have been witnesses to fascinating history for hundreds of years. It was strange stepping back in time, imagining what shadows were lurking in every corner, watching my curious ascent into history. Bram Stoker chose Transylvania, the western province of Romania, as the location of his 1897 gothic novel “Dracula” because of the dark, foreboding feel of the area even when it was bathed in sunshine. The myth of Dracula was so attached to Vlad Tepes and Bran Castle that the locals, when asked about it, shrugged their shoulders with amused looks, and went about their business. The real Vlad Tepes, the inspiration source for Count Dracula, was known for his strong resistance and valiant battles against the advancement and occupation of the Ottoman Empire. “Voievode” Vlad was a real hero and founding father to Romanians. Vlad Tepes was born in the town of Sighisoara, an old medieval citadel inhabited continuously for 600-700 years. Some believe that the home he was born in is still standing and houses a restaurant on the second floor. Vlad III, Prince of Wallachia (1431-1476), was called posthumously “Vlad the Impaler,” for his habit of impaling his enemies and those condemned for capital punishment. Tepes was his Romanian moniker for “Impaler.” He ruled mainly from 1456-1462, the incipient period of the Ottoman conquest of the Balkans. Of the house of Draculesti, Vlad III, son of Vlad II Dracul, was born in Sighisoara, Transylavania and died in Snagov, Wallachia. There is mystery and controversy as to how he died and where he was buried. Officially, his burial place is at the Snagov Monastery near Lake Snagov, a few miles from Bucharest, the capital of Romania. His tomb was opened in 1931 and was found empty. Another version of the story is that a well-dressed decapitated body was exhumed, the head having been sent as a gift to the Ottoman Sultan. Several versions of Vlad the Impaler’s death are described by the Castle Bran museum. One story says that he was betrayed by his Noblemen and killed during the winter of 1476-1477, stabbed in the back with spears. Stephen the Great (Stefan cel Mare), a Moldavian ruler, claimed that ten of his spearman tried to save Vlad’s life and five of them have lost their lives in the process. Some historians believe this account of Vlad’s death to be true. Recorded oral tradition describes noblemen hostile to Vlad, asking him to obey the Sultan and pay tribute to the Ottoman Empire. Vlad decided that, as long as he was alive, such a thing would never happen. The noblemen made the decision then to cowardly kill him. Another oral tradition version describes him as having been killed by his own men who mistook him for the enemy. Vlad frequently dressed in Turkish attire in order to check out the enemy positions. He killed five of his attackers, his own men, but then “he was pierced by many spears” and died. According to the Austrian chronicler Jacob Unrest, Vlad was killed by an ottoman hired as a servant by the ruler. The servant waited until Vlad rode alone and pierced his back with a spear. Whether he died in battle or at the hands of his own noblemen or servant, the fact is that Vlad met an untimely death. Dracula is Romanian for “the son of the Devil.” Historians argue over the meaning of the Latin “draco” (dragon). Vlad was of the order of the dragon bestowed on his father to defend Christianity. However, the Romanian word for dragon is “balaur.” “Dracul” is identified in modern parlance as the “devil.” The Ambras Castle portrait of Vlad III, c. 1560, is reputedly a copy of an original made during his lifetime. The Irish writer Bram Stoker chose the setting of his 1897 gothic novel in Transylvania, in a castle similar to Bran’s Castle, owned by a vampire. Stoker never set foot himself in this “savage” land. Historians described the area as “barbaric” (from the Latin “barbarus,” bearded or foreign) in earlier third century Roman times when Trajan encountered the resistance of the bearded Dacians. Vlad was demonized for his cruelty but there were plenty of other monarchs who engaged in cruelty and questionable methods of capital punishment for their subjects – Louis XI, Henry VIII, and Ivan the Terrible. Vlad managed to defend Wallachia from the Ottoman invasion, defeating Mohammed II, conqueror of Constantinople. Stoker’s vampire, Count Dracula, is a reanimated corpse with fluorescent eyes who feeds on blood. According to myth, each vampire used to be an ordinary human being who liked to feed on blood. Dracula has its inspiration in Romanian folklore. Vampires are spirits of people who died and returned among the living. At first they show their presence by moving furniture and stealing food. “Strigoi” are the evil souls of the dead. The word is derived from “striga,” a witch. Vlad III himself used the word Dracula in letters and documents that survive in Romanian museums. Several sources that describe him have obvious elements of bias in their depiction. Romanians saw him as a hero who defended Transylvania from the Turkish hordes and from lawlessness. Russians described him as cruel in his justice and desire for order. The Turks told about the horrors he inflicted on their soldiers during the battles of 1461-62. Germans printed woodcuts of his portrait and of his alleged atrocities. Pamphlets with horror stories such as “The Frightening and Truly Extraordinary Story of a Wild Blood-Drinking Tyrant Called Prince Dracula” were printed in German and found in Nuremberg and other cities, dating from the 1488-1521 periods. Stoker visited London libraries and captured an amazingly accurate description of the surroundings from travel books and friends’ accounts. The real Dracula Castle where Bram Stoker positioned his character, Dracula, is located in Tihuta Pass in Bargau Gorge, difficult to access except on foot. It is north of Curtea de Arges, in a canyon formed by the Arges river in the Fagaras Mountains, with a strategic rocky precipice to keep the invading Ottoman hordes at bay. Approximately 1,500 steps with metal rails lead up to the walls that shaped the former citadel of Vlad Tepes. Taking control of the castle was difficult because of its size and strategic location. However, in 1888 a landslide crashed a portion of the castle far into the river below. Foreign visitors were allowed during the communist regime to spend the night inside the remaining ruins, which had been repaired. This entry was posted in travel and tagged Bram Stoker, Bran's Castle, Count Dracula, Vlad Tepes, Vlad the Impaler by Admin. Bookmark the permalink. I love your writings. My mother’s Mother and Father were born somewhere in Transylvania, Romania and they immigrated to the USA in the early 1900’s. My oldest brother has made several trips to Romania and I am feeling the need to go and visit. My fondest food is gouluste’ which I am sure you know is stuffed cabbage rolls and she made it with ham. You will love Transylvania! You have to go! Spring and fall are the best times.